The URJC team has maintained advocacy meetings with professors from different disciplines for the insertion of FGM/C into the academic curriculum of next academic year. In this sense, a training course was offered on 15th of June to professors of Nursing, Medicine, Social Work, Law and Communication Degrees. This multisectoral training course was given by URJC team, Wassu Foundation, Medicos del Mundo and UNAF. It was co-funded by the Social Council of the URJC and supported by the vice-rectorate of Professors. As well, students of several degrees have presented their fina research on FGM/C. The papers of the I International Seminar on FGM/C on sociocultural and legal aspects of FGM/C have been translated and edited and will be published during the Summer. Multisectoral Training Guide has also been distributed in libraries and has been sent to reference personalities and universities libraries. Finally, URJC has participated in the 2nd Implementation and Monitoring Committee Meeting of the project in Brussels (WS0) and in the second international academic seminar (“FGM/C at the intersection of qualitative, quantitative and mixed method research – Experiences from Africa and Europe”) held in that city on 8th and 9th of June. 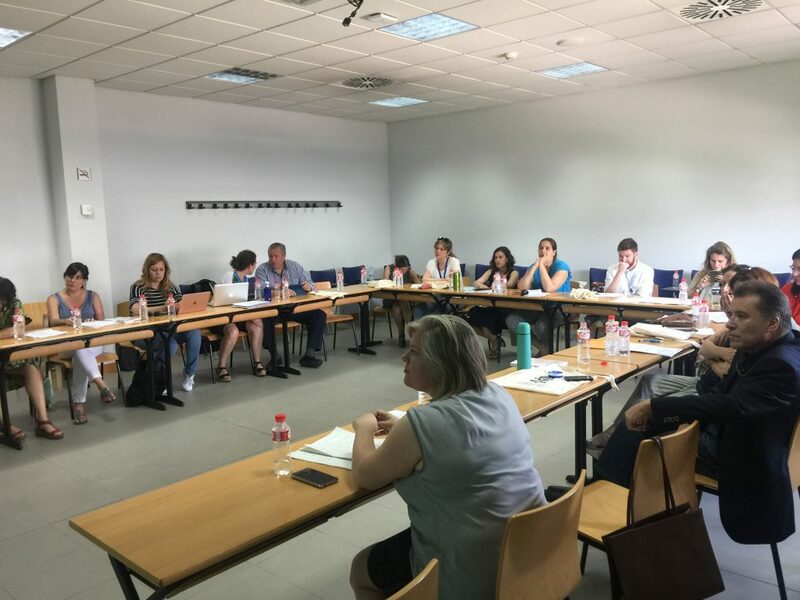 In Barcelona, the Wassu team has continued with the implementation of courses to undergraduate and postgraduate students from social and health sciences. At the moment, 250 students have been sensitized and trained on FGM. The Wassu team has also joined the 2nd Implementation and Monitoring Committee Meeting of the project in Brussels, as well as attended the 2nd Seminar “FGM/C at the intersection of qualitative, quantitative and mixed method research – Experiences from Africa and Europe” on the 8th and 9th of June. Dr. Kaplan presented “FGM-surveys on knowledge, attitudes and practices in the Gambia” on the 9th. Finally, on the 15th, two members of the research group IRGPS/HTP have conducted a training for professors of different disciplines organised by Rey Juan Carlos University in Madrid. In Portugal a total of 366 students and 21 professors have already attended the Multisectoral Academic Training provided by the CEI-IUL team of the MAP-FGM project. CEI-IUL has managed to guarantee the inclusion of FGM modules with the partner Instituto Politécnico de Leiria, in its Education and Social Sciences School (ESECS), and also in ISCTE-IUL. The trainings were implemented between the months of March and May 2017, both in ESECS and in ISCTE-IUL, in the degrees of Communication&Media, Basic Education and Social Service; in the Professional Courses of Socio-Cultural and Sportive Intervention and Intervention in Educational Spaces; and in the Master’s of Pre-School and Basic Education, Development Studies, African Studies and Community Psychology&Child Protection. More trainings for students are scheduled for the first semester of 2017/2018 in ISCTE-IUL as well as a new training for professors coming from Instituto Politécnico de Leiria in October 2017. The latter will take place in order to introduce the MTG to the professors from different specialities and to promote its use as a way to develop their skills on how to teach FGM/C more effectively. Els Leye attended a Webinar on “Measuring change in female genital cutting social norms: an attempt from Tostan’s CG3Y project. Four students from VUB, who followed the optional interdisciplinary course on migration (entitled “Redelijk Eigenzinnig”), have worked on the subject of FGM/C since February 2017. On April 18, these four students presented, as part of their assignment for this course, the communication strategy for the 2nd Academic Seminar in Brussels. The strategy consisted of a communication timeline and a promotion clip. A Map-FGM training was given by Els Leye to students within the framework of the course “Philosophy and ethics of sexuality”. RHEA also assisted with developing the video of the MAP FGM project during this period. The 2nd Academic Seminar “Female Genital Mutilation/Cutting at the intersection of qualitative, quantitative and mixed method research – Experiences from Africa and Europe” was held in Brussels organized by RHEA team with the collaboration of Ella Vancanneyt as part of her masters Gender and Diversity. For Italy, Michela Fusaschi, Giovanna Cavatorta and Valentina Vitale have started the training to eleven professors of the Roma Tre University with different scientific backgrounds. A detailed draft of the International Seminar to be held in Rome on the 24-25 November has been elaborated and all speakers have been invited. Prominent anthropologists having done fieldwork on these practices, such as Henrietta Moore, Sara Johnsdotter and Jean-Loup Amselle, will take part into the event.